Soto has produced six evening length shows in Seattle over the last decade including the warmly received “Gathering Bones” in 2013. Over the past 13 years, Tower has released ten albums and presented her original works in more than 40 cities. However, “Inner Galactic” demanded that they learn the language of each other’s art, with Tower working on dance movements and Soto consulting on the music. Both worked on the design of the production and perform in the piece. “It’s a show about friendship. And it’s equally told through movement and sound,” said Soto. 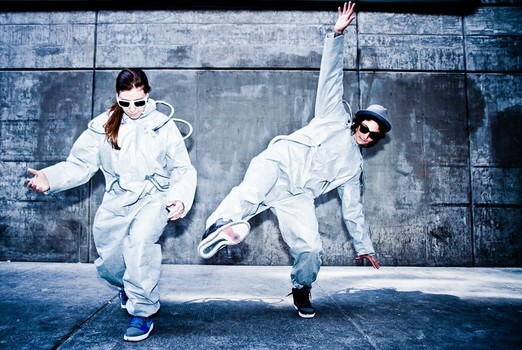 The creation of “Inner Galactic” was part of Velocity Dance Center’s Creative Resident Program. They also received support from 10° (Seattle), Exit Space - From Studio to Stage program and took an artistic retreat at Higher Ground Community in Bend, Oregon. “We did everything ourselves from costumes to sets. There’s a large visual design element that required many trips to Home Depot,” said Soto. “We’ve both been immersed in this work for a whole year,” noted Tower.